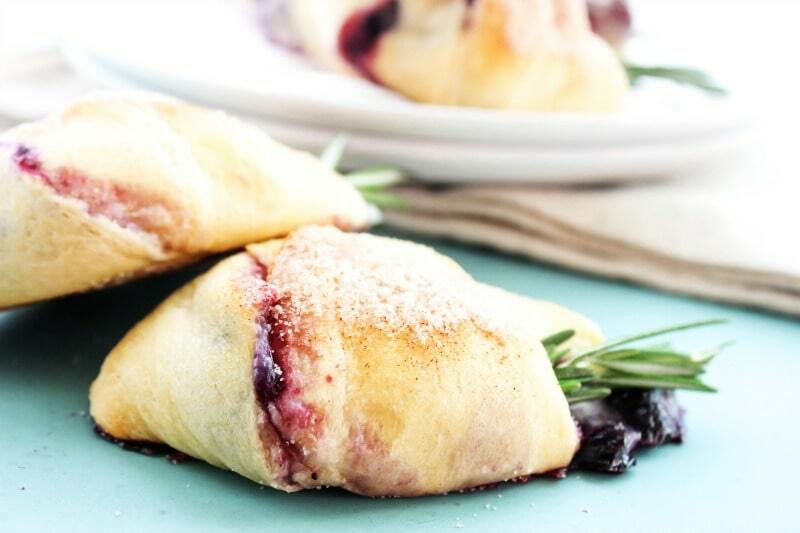 Simple, elegant, and easy to prepare, these Berries & Brie Crescent Rolls are a twist on a classic. Fresh berries & brie rolled up in a bite-sized appetizer. 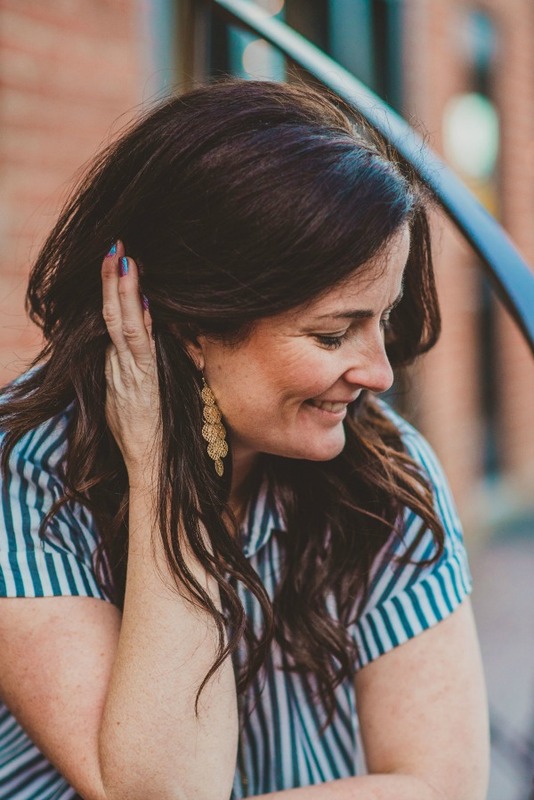 It was so fun collaborating with Pillsbury on this post. All opinions expressed are my own. I love finding festive appetizers for holiday parties. 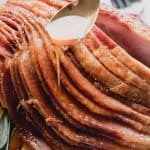 From Thanksgiving to Christmas and New Year’s, there are always several occasions where we need to bring a sweet or savory treat. A classic that seems to be at every holiday get together is a brie cracker dip with some sort of berries. This is my sister Nicole’s signature dish. And while I love this as a centerpiece, I get kind of bugged by either the lack of cheese or berries I get on my cracker. And then there’s those double-dippers (you know who you are). These Berries & Brie Crescent Rolls solve both of these issues. I used Pillsbury Crescent Rolls as my vehicle to wrap up the brie and berries together. What I love about this is you can add as much or as little brie as you want. I cut the brie into ¼ inch slices, which I think went perfect with a tablespoon of berries. I also added a sprig of rosemary immediately after cooking as a beautiful garnish. 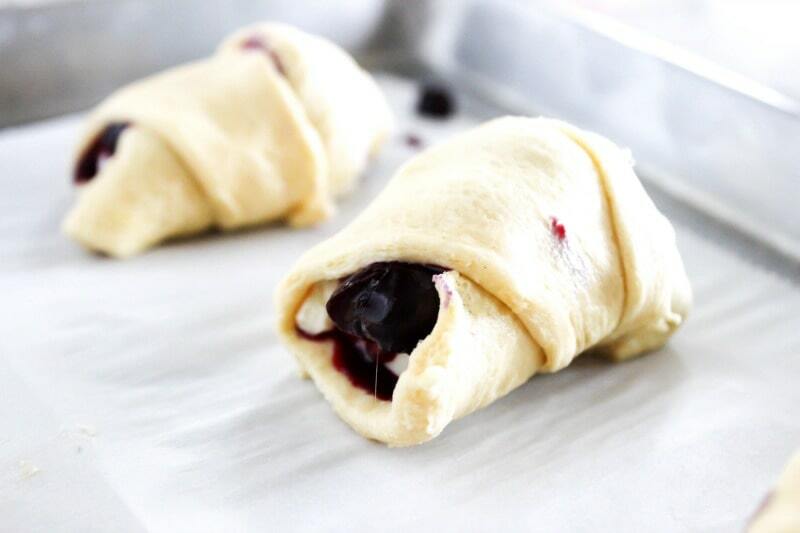 The Pillsbury rolls worked perfectly, and I was able to wrap up the brie and berries all in one. I left a small opening on one end so my guests could see what was inside, adding a gorgeous and festive touch. 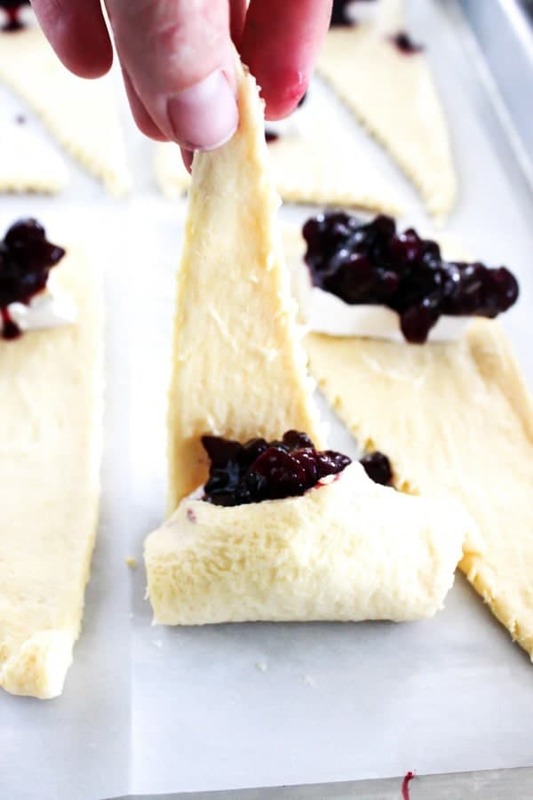 How do you make Berries & Brie Crescent Rolls? In a large saucepan over medium-high heat, bring cranberries, blueberries, sugar, and 1/2 cups water to a boil. Heat and simmer until most of the blueberries have popped and cranberries are falling apart, 10 to 15 minutes.Remove from heat; add salt and stir to combine. Open up one package of Pillsbury Crescent Rolls and lay crescent rolls on a parchment paper lined baking sheet. Add one slice of brie cheese about the center of the crescent roll. Make sure it is entirely encased in the roll, you do not want it hanging out. Top the Brie with berries, about 1 tablespoon each. Wrap up the rolls as pictured. Repeat with remaining dough, brie, and berries. Once all the rolls on are on the pan and rolled up, sprinkle with cinnamon and sugar. 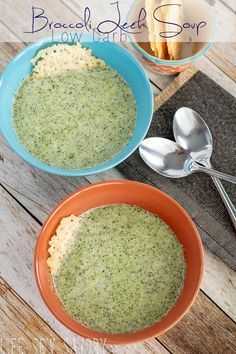 Place in the oven and bake for 14-16 minutes or until a light golden brown. If you cut thick brie, cook the crescent rolls a bit longer to ensure it is melted. Remove from pan and slide in a rosemary sprig as garnish. 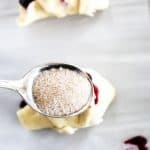 Place the remaining berry compote in a small serving bowl, for those who want to add more. Place crescent rolls around the compote on a serving plate. Serve and enjoy! 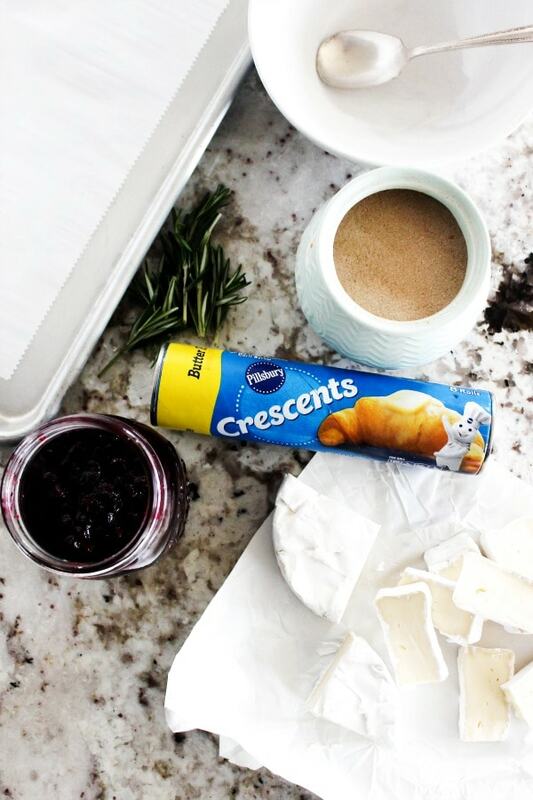 My favorite kitchen items I used to make Berries & Brie Crescent Rolls. 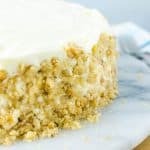 Sheet Pan: Using a larger sheet pan while cooking is great for me because I am feeding my family of seven. I love aluminium for when I do sheet pan meals. Start with this 13 by 18 half sheet pan. I love these pans so much that I have 9! 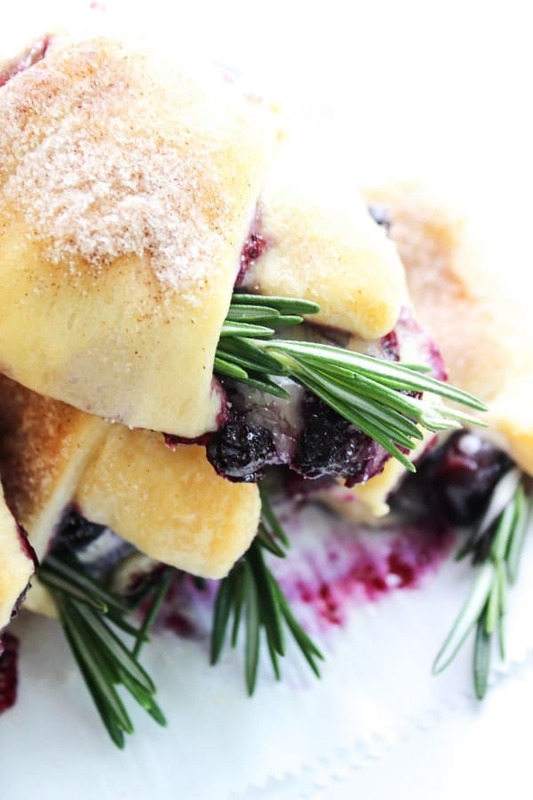 Pin this recipe for Berries & Brie Crescent Rolls to your favorite Pinterest board for later. 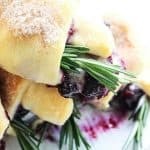 Simple, elegant and easy to prepare these Berries & Brie Crescent Rolls are a twist on a classic. Fresh berries & brie rolled up in a bite-sized appetizer. Heat and simmer until most of the blueberries have popped and cranberries are falling apart, 10 to 15 minutes. Remove from heat; add salt and stir to combine. Repeat with remaining dough, brie and berries. 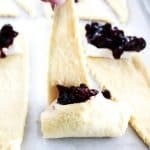 Place crescent rolls around the compote on a serving plate. 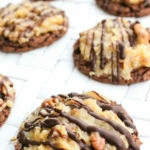 I want to make a full batch of these and just eat them all by myself. These are gorgeous! I love the rosemary and berry combination! Your directions show “grapes”…… I know you meant “cranberries falling apart”….. looks yummy! 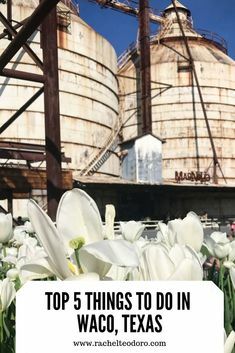 Love how easy these are to make! Perfect when someone pops over. They really are, I hope you enjoy! Love these! I could make this my dinner!! I hope you like them, thanks! These rolls are so elegant! Such a fantastic gourmet appetizer!! 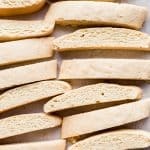 I love how easy and delicious these rolls are! Perfect appetizer for a party! I love the rosemary with them! 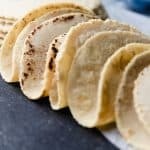 These look sooooooo tasty! 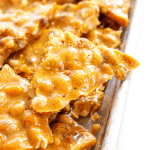 Going to make them for my next GNO!